This is the best priced pre-owned 101' Hargrave yacht currently on the market! : Atlantic Yacht & Ship, Inc. This is the best priced pre-owned 101′ Hargrave yacht currently on the market! 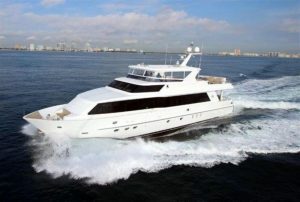 Chris Carroll is excited to announce a major price reduction on an pre-owned 101′ Hargrave yacht for sale! In the first place, this pre-owned 101′ Hargrave yacht has undergone a massive list of upgrades. In fact, this pre-owned 101′ Hargrave yacht is the most upgraded 101′ Hargrave currently on the market. Not to mention the all new audio and visual systems. These include an HD7 satellite TV system and iPad controls. This yacht boasts the desirable four guest room layout including a main deck master stateroom! By the same token this pre-owned 101′ Hargrave yacht is as mechanically sound as she is aesthetically. Powered by twin Caterpillar C-32 engines, this pre-owned 101′ Hargrave can hit speeds up to 20 knots. Furthermore, having completed the 1,000 engine service, this yacht is “turn-key” and ready to cruise. This owner is motivated to sell and would consider a possible sport fish trade. Launched in 2010, this yacht has been expertly maintained and it shows. All electronic upgrades were completed in June 2016. For more information on this pre-owned 101′ Hargrave yacht for sale be sure to contact Chris Carroll today! Check out this used 101′ Hargrave yacht for sale in Florida! This quality pre-owned 68′ Hargrave yacht is priced to sell!